← Is ALL red meat bad for you? I just came back from visiting Brazil and had the chance to spend a few days in the Amazon Rainforest. And I’m not going to lie, I was all about the acai berry when I was down there. 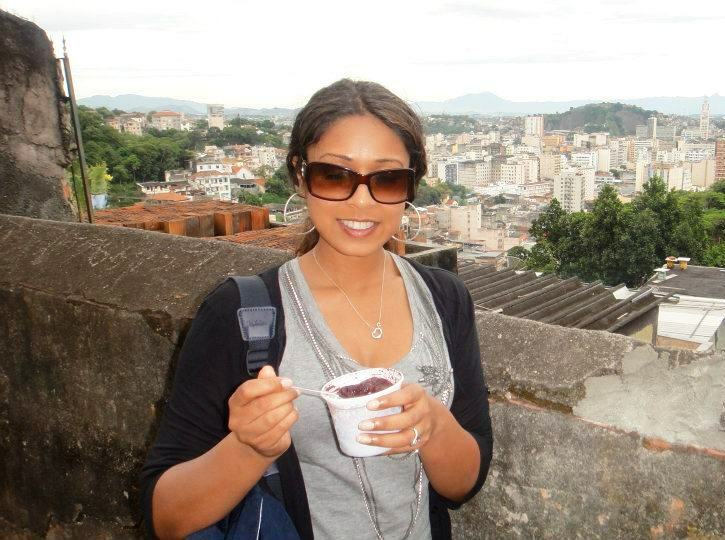 From acai berry sorbet on the beach to acai berry jam in the amazon, I was in love! I even brought back acai berry jewelry! When you’re in this region, it’s hard to ignore this amazing fruit, especially after all the hype you hear about it. But does this superfood live up to all the hype back in the US? So what is the acai berry? 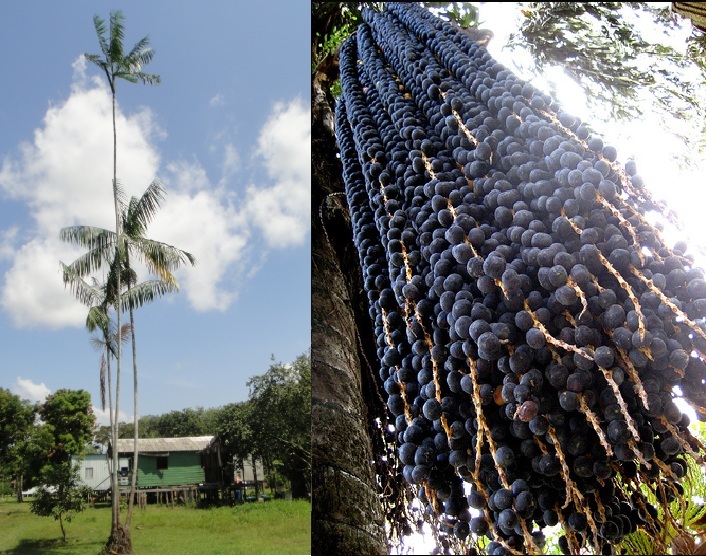 The acai berry comes from the acai palm tree (photographed below) which is native to Central and South America, particularly in the Amazon region. The fruit is small, round and the pulp is a black-purple color. The seed makes up about 80% of the fruit and the remaining is a viscous pulp that can be eaten raw or as a juice. The fruit pulp contains about 4% protein and 12% lipids, with the majority of lipids being a monounsaturated fat called oleic acid. Not only is the acai berry a complete food containing all the macronutrients, additionally, they are rich in nutrients like vitamins A, C, and E, calcium, phosphorus, iron, thiamine, and are most known for containing antioxidants like polyphenols and anthocyanins. What are the Health Benefits of Acai Berry? Ever since Oprah and Dr. Oz presented the acai berry as a “super food” the food industry has been all over trying to make all sorts of acai products with numerous health claims. Unfortunately, many of the health claims are not true, at least not from any scientific studies done so far. That being said, the one health benefit we do know is true about acai berries is it’s antioxidant power. 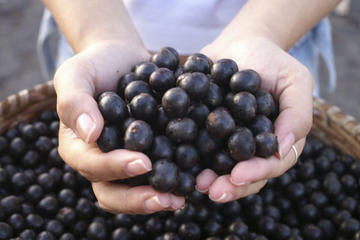 Animal studies and in vitro studies have found that acai berry is a very powerful antioxidant. Research has shown that anthocyanins and polyphenols in the acai berry are antioxidants that help defend the body against life’s stressors. They also play a role in the body’s cell protection system. Free radicals are harmful byproducts produced by the body. Eating a diet rich in antioxidants may interfere with aging and the disease process by neutralizing free radicals. Antioxidants in general may help reduce the risk of some diseases, such as heart disease and cancer by lessening the destructive power of free radicals in the body. In addition, an animal study also found that regular consumption of acai berries improved lipid profiles in rabbits and rats, which could help reduce risks of heart disease. However, this has not been tested in humans yet so is still a bit of a stretch to claim this as a health benefit just yet. I did find one study conducted in humans which was a pilot trial with only 10 participants aimed at looking at whether or not acai berry could improve the metabolic profile of overweight adults. This study found that participants that consumed the acai berry pulp regularly had improved cholesterol, triglyceride, and insulin levels after just 30 days. This is a promising study but unfortunately because it was done in such a small sample and specific subset of individuals of overweight and unhealthy adults, the results are not generalizable to the public– so again we don’t know for sure how beneficial the acai berry can be in lowering cholesterol and triglycerides in humans just yet. However, it does prove the need for additional research to explore these and other potential health benefits in humans. Another study actually found that red wine, pomegranate, grape juice and blueberry juice actually have higher antioxidant power than acai juice. So just remember that all the health claims made by acai berry product manufacturers like helps fight heart disease, helps people lose weight, prevents aging, stops cancer, improves sexual performance, improves digestion, improves sleep, improves arthritis, and improves general health, are mostly not yet proven scientifically in humans yet or can be achieved from antioxidants from other berries such as blueberries, pomograntes, etc. I enjoyed eating my fair share of acai berry when I was traveling in Brazil, but until the health benefits of the açaí berry are scientifically proven, it seems more reasonable, cheaper, and safer to get your antioxidants from other fruit and vegetable sources rich in antioxidants like blueberries, pomegranates, strawberries, etc that are more readily available in the U.S.
Until further research is done, I would avoid any acai berry supplements since they have not yet been studied extensively and we do not yet know if the health benefits from the acai berry resembles that from supplements. Additionally, I would definitely be suspicious of “free-trial offers” for acai products. Buy freeze-dried acai berry and use in smoothies. Here’s a recipe you can use. Eat acai berry as part of flavored products like ice cream, sorbets, and jellies. Each brand and food product has different amounts and forms of acai berry in their products so keep in mind this may not be the best method of getting your antioxidants. As a juice– but remember some juices are better than others. Make sure to read the ingredients and nutrition label. Many are mixed with other juices and contain a lot of added sugars which would generally cancel out the benefit from the antioxidants of the acai berry. So if you’re not drinking it just for the flavor, make sure to read the labels to ensure you minimize the added sugar and other ingredients. I also started seeing chocolate covered acai berry on the market. I took a look at the label and it seems that they don’t always use the actual fruit but they use the acai berry fruit juice or pulp mixed with other juices, then diped in chocolate. So again, seems like all the processing and added ingredients may outweigh any benefit received from the antioxidants. Overall, my recommendation is to get your antioxidants from other berries that are easily available and cheaper in the U.S. until 1.) more research is done and in fact shows that acai berries are indeed much more beneficial to your health than other fruits 2.) fresh or freeze dried acai berry is more readily available in the U.S. If you like acai berry products, that’s fine, but just make sure you’re eating those products for the taste and flavor and not just for the health benefits since often times these products contain lot’s of added sugars and ingredients. And last, if you go to South America, enjoy all the acai berry you can get :). Natural, fresh, and tastes so good! what did the fresh acai berry it taste like? sweet, sour, any comparisons to local fruits? Well I had the frozen pulp and it’s probably the most similar to a mix of blueberries and blackberries in flavor ..but a bit more tart/nuttier. But The actual fruit has a seed inside each berry so if you eat it raw it would feel more like a grape with seeds.